We pride ourselves on the care, well-being and happiness of all our dogs during their six months quarantine stay, look at our owners page to see what they have said about our Centre on behalf of their pets. Our kennels are relatively new and have been built to a high standard and are fully insulated. The kennels have double wire fencing between the exercise runs to allow the dogs to see each other, they can run up and down with their neighbours and get to know them. 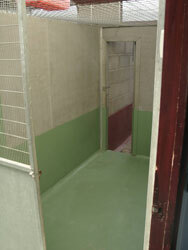 The runs are attached to the kennels and are larger than the Ministry of Agriculture requirements for three dogs sharing. Each dog is provided with a plastic basket to suit and plenty of dry, clean bedding. We have kennels that are licensed to take up to three dogs from the same owner. Outdoor covered run 5ft 10in x 19' 9"
We have first class brands of dog food including food for those with a delicate stomach. All dogs are fed according to breed and type and there are alternatives if your dog does not like his/her diet. We have a range of wet and dry foods. We do accommodate for special diets and requirements wherever practical and possible. All our canines seem to thrive on the food they are given. Our boarding fee includes whichever formula is most suitable from our range of food. We do give good night treats as required. Here at Yorkshire International grooming is a very important part of our care. Your dog will be bathed, brushed and nails clipped, if needed, on a regular basis (the longer coated dogs more often to keep their coats free from tangles). This comes at no extra charge to you. If a professional is required to clip your pet, this can be arranged at an extra cost to the customer. We do a late check each evening at around 9pm, when the dogs are let out. We then bring them back in and they are given treats to help them settle down for the night. We make sure each dog is well before retiring ourselves.